Season beef with meat seasoning, mix well. Cover and chill for at least 30 minutes. Bring 5 cups of water to a boil on high heat. Add in beef, stir to loose up the meat. When the soup boils again add cooking wine, followed by starch water while stirring the soup. When the soup starts boiling again, add salt and ground white pepper to taste. Pour in egg whites while stirring the soup. Turn off heat and add in green onions and cilantro. Serve immediately. 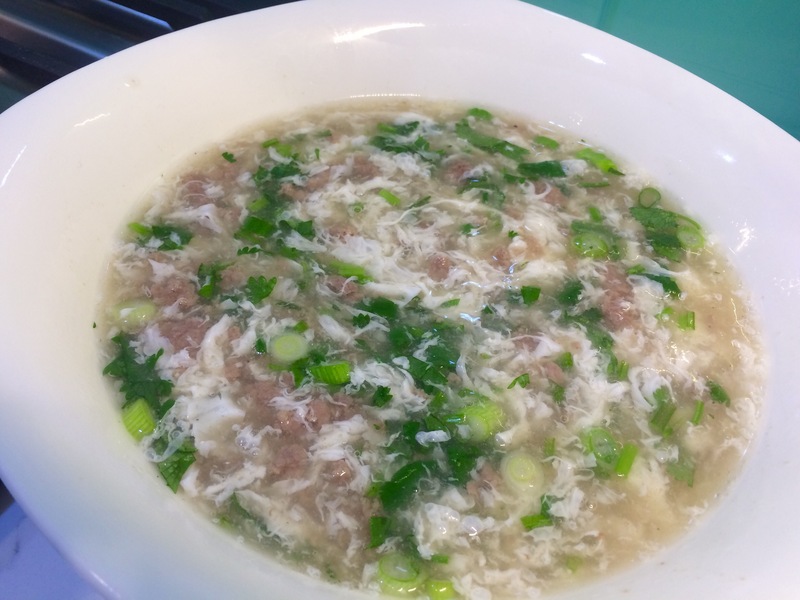 Egg White: Do not whisk egg white as it will create egg white bubbles in the soup. 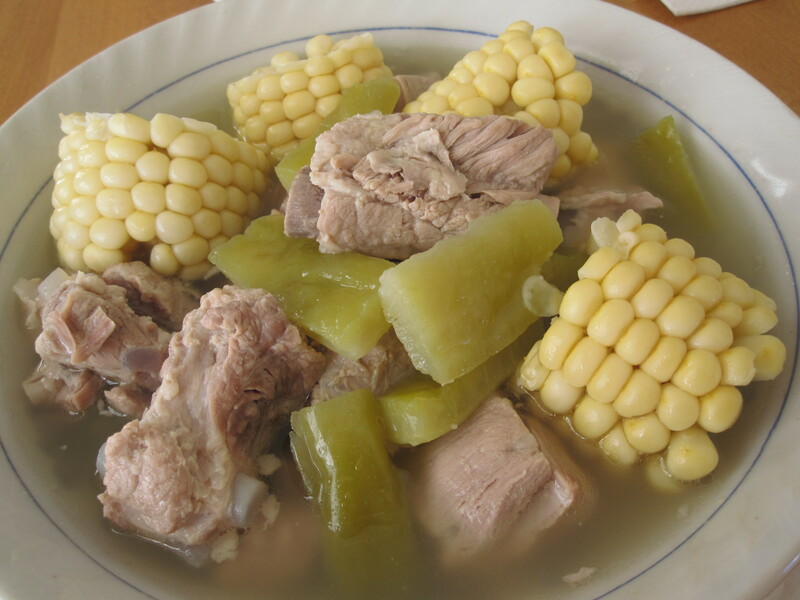 This is just a variation of my corn and rib soup. The whole family has been having lots of grilled and fried foods lately. I want to make some bitter melon soup for the family to tone down the heaty side, but knowing everyone of them can’t take the bitterness, I sneaked in with some sweet corns that are in season now. And it worked. There is a slightest bitterness in the soup but none of them tasted it. In fact my oldest son Alexander, who is expected to be the first one on the rejecting list, asked for second serving of the soup. Add 1 tsp of salt to cut bitter melon. Add a little water and use you hand to gently squeeze the melon, so it will draw out some bitter liquid. Let it sit for 10 minutes. Wash and rinse a couple of times. Drain. Blanch ribs in boiling water for a minutes to remove impurities. Rinse and drain. In a deep pot boil water and chicken broth over high heat. Add in blanched ribs. Cover and boil on high heat for 10 minutes. Turn down to medium heat and boil for 1 hour. Add in corn and bitter melon. Cover and continue cooking on medium heat for another 1- 1.5 hours. Add more water if the liquid is low. Add salt to taste. 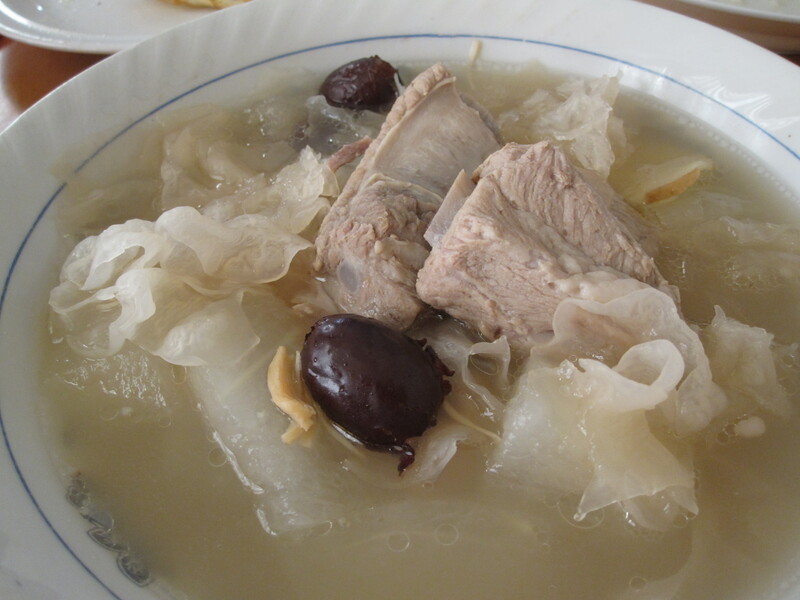 If mild bitterness is preferred, remove bitter melon from the soup ahead of time once they are tender. Add dried scallops, red dates, ginger and water to a big pot and bring to a boil. Meanwhile, fill a medium pot with enough water then bring to a boil. Add spareribs to blanch. Remove from heat. Rinse blanched spareribs under water remove any bloody impurities, drain. Let the big pot boil on high heat for 5-10 minutes for the flavor to come out. Add blanched spareribs, cover and boil on high heat for 5 minutes. Then turn heat down to medium and boil for 1 hour. Add fungus, cover and boil for another 45 minutes to 1 hour until fungus just turn soft, adding more hot water if necessary. Put in winter melon and continue boiling for another 5 minutes. Add salt to taste. When served, dip the melon, fungus and meat with fresh hot pepper soy sauce if desired for that spicy kick on the taste.